Parramatta Town Hall, Church Street. Designed by George Allen Mansfield and built by Hart and Lavors, 1881-1883. The site was originally marked out as a market in Governor Phillip's plan for Parramatta; and a market fair was held here in 1813. 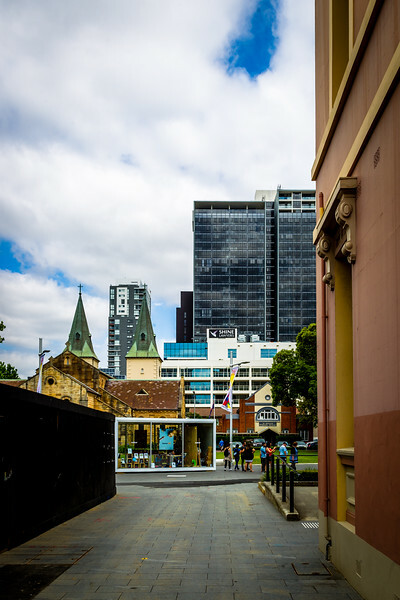 Transformation of Civic Place into Parramatta Square - one of Parramatta's largest urban renewal projects. New homes are being constructed to replace the library, post office, shops and council buildings. Originally conceived in 2006, the project was put on hold in 2012 due to the GFC (global financial crisis). Reborn in 2016, construction work finally began.